What are the best GPS units for big trucks in 2019? 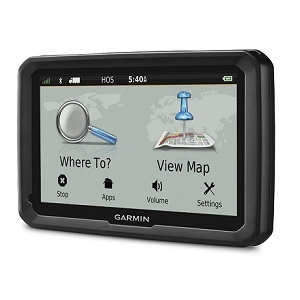 Have no time to find out what the best GPS for big trucks is? If that’s so, this paragraph can help you. 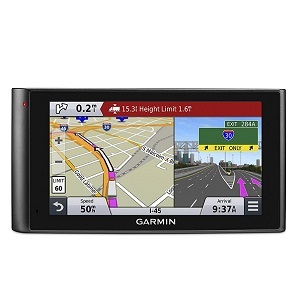 After having looked at the consumer reports, sales figures, and a plethora of reliability studies, we’ve come to the conclusion that the Garmin dezl 770LMTHD is the one you should bear in mind the next time you’re in the market for such a navigational device. The main benefit offered by this product is that it comes with a truck and trailer services directory, thus allowing you to find points of interest such as hotels, parking facilities, and restaurants. You can even use the GPS to log your mileage and keep tabs on your fuel consumption to make sure that your truck is performing as it normally would. Customized routing is an innate characteristic of this alternative. Should you be unable to get the Garmin dezl 770LMTHD, maybe you’d want to consider the second best choice, the Hieha GPS01-US. Making sure that you’re spending your money on the right GPS for truck routes is a daunting task nowadays, as the market seems to be overflowing with decent options. If you have little to no experience when it comes to selecting a navigational unit in this line, we’re here to give you a hand. Check out the following step-by-step guide to find out what factors you should focus on. First and foremost, you need to make sure that the GPS you’re thinking of buying has, indeed, been designed for truck use. Some models are more versatile as you will be able to utilize them for a variety of vehicles, but others are more limited. Since it often comes down to ease of use and convenience, you’ll have to make the most out of your choice by setting the size and weight of your truck. Customizing the interface depending on the dimension of your truck is of particular importance if you have to reach your destination in a timely fashion. It would be a disaster for commercial drivers to realize that they can’t pass through a tunnel and then have to go back and take another route. Take the time to go through some of the best GPS for trucking reviews, if you can, as other drivers can let you know what to expect. With some GPS units, what you see is what you get. The price difference between a model that comes with free lifetime updates and one that might not even be that critical. Think of it this way. If you loathe paying extra for maps, you need to get a model that’s linked to the manufacturer’s system and that you can update on your own. The process isn’t overly complicated, as you’ll often just have to get online, download the update, and then load it onto your navigator. Some extras range from alerts to red light cameras, and if you plan to use your GPS as a radar detector, as well, you ought to look for these features. When it comes to the screen of the product, you need to make sure that it’s backlit and that it is somewhat glare-free. It’s a pain to try to see the info when the sun is shining brightly in the sky especially with a model that does not come with a glare-free display. As for the size, if you haven’t experienced with using a navigator before, you may be tempted to look at the screen instead of quietly listening to the audio instructions. It doesn’t take all that much to understand that you should keep your eyes on the road all the time, both for your safety and for that of the other drivers around you. A larger display can help you get rid of this inconvenience. Available as 5-inch and 7-inch navigators, this model should be one of the first you may have to consider. It has a series of characteristics that are pretty hard to say no to, and one of them consists of the fact that you’ll be able to set the right size and weight of your truck both easily and efficiently. Not only this, but you’re also likely to enjoy the services directory that has been included in the interface of this model. You’ll never have to drive for several miles just to find out where the next diner is located or by having to look out the window. The device will let you know conveniently. Parking facilities, restaurants, motels, and hotels are all included in this directory. What’s more, let’s not forget the fact that most drivers want to know just how much fuel their trucks are capable of consuming while they’re making a longer trip. This unit can help you do just that as it comes with a logging functionality that you are likely to appreciate. You can track maintenance, fuel use, as well as hours of service. Having been designed with the needs of modern consumers in mind, this Garmin choice is surely worth taking into account. There are several reasons to give some thought to this Hieha navigator. One of the first things that you are likely to notice is that it boasts a somewhat smaller display that measures just five inches. Nonetheless, this dimension is usually more than enough for most GPS users. 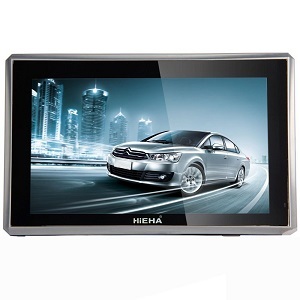 The neat thing about the Hieha GPS01-US is that it can be utilized for many types of vehicles. Depending on the settings that you will be using with it, you can install and utilize it in your car, bus, truck, or taxi. The model supports anything from Lane Assist to Speedcam Warnings so that it can be a real friend in need, on occasion. This particular alternative comes with a series of preloaded maps of the US, Canada, Colombia, and Mexico. This is not a limitation, however, as you can benefit from free lifetime map updates of over fifty countries all over the world. The package contains a suction mount, a pouch, a stylus and a rear bracket, as well as a USB cable and car charger. Most of those who were kind enough to provide feedback in regards to this product say that it is easy to use and gets the job done. Others argue that it doesn’t let you select the route you favor, which might be a drawback, in some respects. 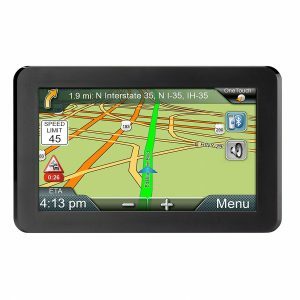 This truck navigator comes with a 6-inch display that can guide you to your destination safely and conveniently. The glass screen can ensure that you’re able to take a peek to the displayed data without having to squint. One of the main advantages guaranteed by the LMTHD consists of the fact that it has been outfitted with a built-in dash cam. What this means for you is that you’ll get recordings of your drive. While no one likes to think of this possibility, sometimes you may have to be safe other than sorry; it’s reassuring to know that, in the unlikely event of an impact, this device automatically saves the files it has recorded. With custom truck routing, you will be able to set the weight and size of your vehicle and consult the right routes. A variety of locations and services are made available by the user-friendly interface, and they range from parking areas to truck-friendly lodging. Another winning detail about the LMTHD is that it comes with a set of route warnings. In case there’s any sharp curve ahead of you, you’ll be notified so that you can adjust your driving depending on it.